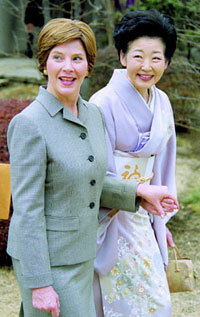 Kiyoko Fukuda and U.S. first lady Laura Bush stroll in the garden of the Akasaka guesthouse in Tokyo in February 2002. Kiyoko Fukuda is said to have married new Prime Minister Yasuo Fukuda because he promised that he would never make her a politician's wife. Despite her sociable and energetic personality, Kiyoko gave up on becoming a flight attendant even though she was offered a job when the couple married in 1966. The 63-year-old was in the limelight in February 2002 when she attended a string of welcoming events for a visiting US President George W. Bush and the first lady Laura. By virtually playing the role of first lady, she developed a relationship with US first lady Laura Bush. Fukuda was serving as chief Cabinet secretary at the time for Prime Minister Junichiro Koizumi, who is divorced. Kiyoko is a niece of former House of Representatives Speaker Yoshio Sakurauchi. Seiichi Ota, former director general of the Management and Coordination Agency, is also one of her relatives. Yasuo Fukuda, whose father was also prime minister, had a strong aversion to politicians and worked for an oil company for 17 years. After he became a politician, Fukuda is said to have handled most of his campaigning activities while he was chief Cabinet secretary. Fukuda and Kiyoko have three children. One of their sons now is his secretary. The 71-year-old was elected Japan's new prime minister on Tuesday after Shinzo Abe’s sudden resignation because of "health problem".